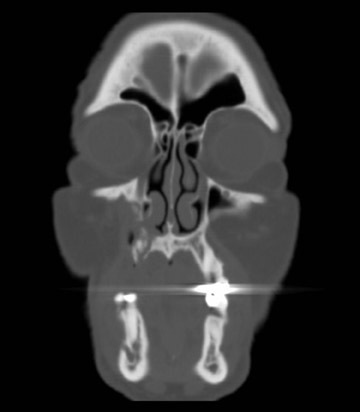 Axial and coronal computed tomography (CT) images of the maxillofacial bones (Figures 2 and 3) demonstrate extensive cortical destruction, osteosclerosis, cortical thickening, and fragmentation of the right maxilla, which extends into the frontal process of the zygomatic bone and pterygoid plates. 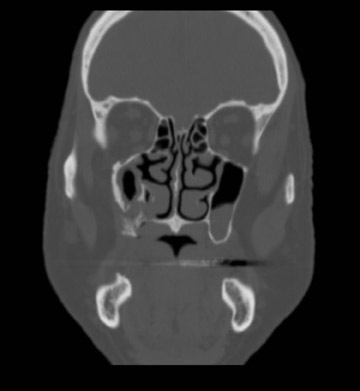 The anterior wall of the maxillary sinus, as well as the palatine process, are mildly depressed, and the lateral and medial walls of the sinus are fragmented, with several bony sequestra present within the sinus cavity. There is sparing of the orbital floor. 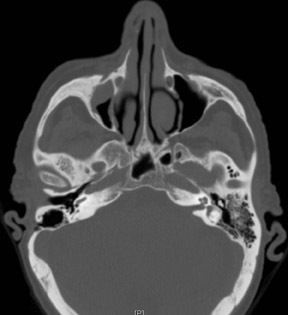 There is an oroantral fistula, mucosal thickening of the maxillary sinus, and a small amount of soft tissue gas extending from the fragmented sinus. A small amount of soft tissue fluid is noted within the right cheek; however, there is no evidence of soft tissue infection. 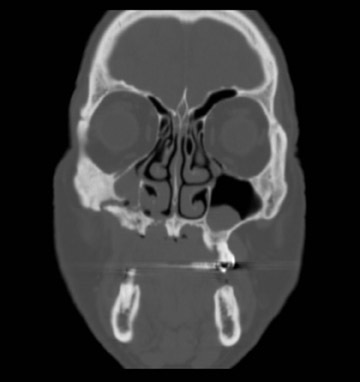 An incidental note was made of a left maxillary sinus mucus retention cyst, with an otherwise spared contralateral maxilla. The mandible (not shown) was uninvolved. 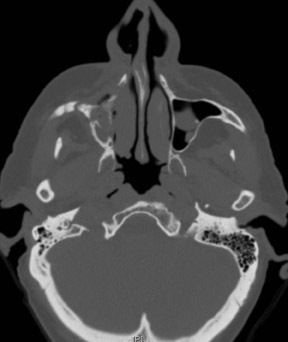 Bisphosphonate associated osteonecrosis of the jaw (BON) is defined as the unexpected development of necrotic bone in the oral cavity of a patient who is receiving bisphosphonate treatment and has not received radiotherapy to the head and neck. BON is an evolving complication whose incidence has steadily increased since the clinical use of bisphosphonates in oncology was first approved and their intravenous use in treating patients with bone metastasis was introduced in 1995.1 The first bisphosphonate treatment of patients with osteonecrosis of the jaw (ONJ) was reported in 1997.2 Since then, more than 2,000 cases have been reported to the United States Food and Drug Administration (FDA).3 Although long familiar to those in oral and maxillofacial surgery and dental circles, BON was not yet well known in radiology at the time of this writing. However, its recognition is essential to patient management, as timely diagnosis can impact patient morbidity considerably. Presenting symptoms have been reported relatively consistently throughout the literature, with patients typically complaining of a painful, “nonhealing” extraction socket or exposed bone with progression to sequestrum formation associated with localized swelling and purulent discharge.4,5 Although surgical extractions/jaw trauma and radiotherapy have commonly been identified as predisposing factors for osteonecrosis, there are reports of spontaneous exposures and necrosis of the alveolar bone,12 as shown by Ruggiero et al., where 9 of 63 patients (14%) had no history of recent dentoalveolar procedures, yet presented with spontaneous bony exposure and alveolar bone necrosis. A recent study by Chiandussi et al. employed conventional radiography, CT, magnetic resonance imaging (MRI), and a 99-Tcm-MDP3-phase bone scan on each of 11 individuals with BON in an effort to describe the features of each modality and aid the prompt recognition of the condition. Bisphosphonate associated osteonecrosis of the jaw represents a serious side effect of bisphosphonate administration. Although treatment regimens, including discontinuation of the offending drug, surgical debridement/sequestrectomy, hyperbaric oxygen, and longterm antibiotic therapy have been advocated, a universally accepted, standardized treatment protocol for BON had not yet been adopted at the time of this writing, as none of these treatments alone, or in combination, had proven consistently efficacious. Consequently, the focus rests on prevention and early detection, as timely diagnosis can influence disease outcome considerably. Migliorati CA, Siegel MA, Elting LS. Bisphosphonateassociated osteonecrosis: a longterm complication of bisphosphonate treatment. Lancet Oncol. 2006;7:508-514. Dimitrakopoulos I, Magopoulos C, Karakasis D. Bisphosphonateinduced avascular osteonecrosis of the jaws: a clinical report of 11 cases. Int J Oral Maxillofac Surg. 2006;35:588-593. Assael LA. A Time for Perspective on Bisphosphonates. J Oral Maxillofac Surg. 2006;64:877-879. Chiandussi S, Biasotto M, Dore F et al. 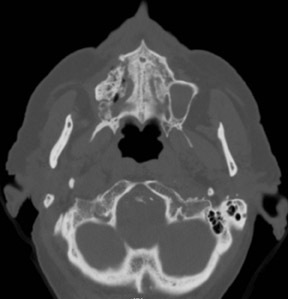 Clinical and diagnostic imaging of bisphosphonateassociated osteonecrosis of the jaws. Dentomaxillofac Radiol. 2006;35:236-243. Ruggiero SL, Mehrotra B, Rosenberg TJ et al. 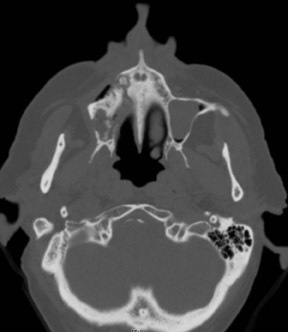 Osteonecrosis of the jaws associated with the use of bisphosphonates: a review of 63 cases. J Oral Maxillofac Surg. 2004;62:527-534. Ashcroft J. Bisphosphonates and phossyjaw: breathing new life into an old problem. Lancet Oncol. 2006;7:447-449. Bamias A, Kastritis E, Bamia C et al. Osteonecrosis of the Jaw in Cancer After Treatment With Bisphosphonates: Incidence and Risk Factors. J Clin Oncol. 2005;23:8580-8587. Delibasi T, Altundag K, Kanlioglu Y. Why osteonecrosis of the jaw after bisphosphonates treatment is more frequent in multiple myeloma than in solid tumors. J Oral Maxillofac Surg. 2006;64:995-996. Woo SB, Hellstein JW, Kalmar JR. Systematic Review: Bisphosphonates and Osteonecrosis of the Jaws. Ann Intern Med. 2006;144:753-761. Dimopoulos MA, Kastritis E, Anagnostopoulos A et al. Osteonecrosis of the jaw in patients with multiple myeloma treated with bisphosphonates: evidence of increased risk after treatment with zoledronic acid. Haematologica 2006; 91:968971. 2006;91:968-971. Merigo E, Manfredi M, Meleti M et al. Jaw bone necrosis without previous dental extractions associated with the use of bisphosphonates (pamidronate and zoledronate): a fourcase report. J Oral Pathol Med. 2005; 34:613-617. Leite AF, Figueiredo PT, Melo NS et al. Bisphosphonateassociated osteonecrosis of the jaws. Report of a case and literature review. Oral Surg Oral Pathol Oral Radiol Endod. 2006;102:1421. Bisphosphonate associated osteonecrosis of the jaw. Appl Radiol.